Ministers say they will press ahead with plans to introduce ID cards, despite three defeats in the House of Lords on Monday evening. Peers voted to block the scheme until its full costs were known. They also voted for more security provisions, and for more controls on who can access the data. Ministers say costs cannot be revealed at this stage as it would be hard to get a good deal, and that security concerns are covered by existing laws. The government is likely to try to overturn the defeats when the bill returns to the Commons. But before that, the peers will continue looking at the proposals in detail next Monday. If there are further defeats, ministers will come under increasing pressure to make concessions, says the BBC's Sean Curran. Tory and Lib Dem peers complained that the government's refusal to say how much the scheme would cost to start up was "unconstitutional". After the first Lords vote, Home Office Minister Andy Burnham said he would study the debate carefully but found it hard to believe the opposition amendment was sensible. "People want us to keep the costs of the ID cards down but this amendment would limit the government's ability to do that," he said. He said it would require ministers to disclose estimated costs which they did not want potential suppliers to know. The defeats come after a new report from the London School of Economics said the Home Office was relying on guesswork and had underestimated the costs. Conservative peers were so determined to get at the real cost of the scheme that they proposed holding a rare secret session of the Lords to discuss the issue. Shadow home affairs minister Lady Anelay said the government had rejected that offer. As the Lords began the report stage of the Identity Bill, Conservative Baroness Noakes said the government had given "absolutely no information" about the scheme's start-up costs. It was unprecedented that legislation with such major consequences should go forward without Parliament being able to scrutinise the financial impact, she said. Liberal Democrat spokesman Lord Phillips of Sudbury said it would be "constitutionally wrong" not to insist on a full estimate of the costs across government. "At the moment we are being offered a pig-in-a-poke; the cart before the horse," he said. The Home Office estimates the scheme will cost about £584m to run each year, with each combined biometric passport and identity card costing £93. But it has not given full cost estimates for setting up the scheme and says its overall costs will depend on how government departments choose to use the card scheme. In a new report, the LSE sticks by its claims that the scheme would cost between £10bn and £19bn over 10 years if the government followed its original plans. Simon Davies, one of the academics involved in the scheme, said it was impossible to update the costs because the government was "changing the goal posts", including making it less secure. Mr Davies, who is also director of the Privacy International group which opposes ID cards, complained there was a "culture of secrecy". Ian Angell, head of the LSE Department of Information Systems, said: "Contradictions, guesswork and wishful thinking on the part of the Home Office make a mockery of any pretence that this scheme is based on serious reasoning." But the Home Office says the LSE is using "fantasy figures". 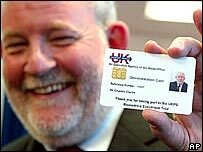 Conservative leader David Cameron vowed on Sunday to oppose the ID card plans, calling them "un-British". "I don't like the idea that you have to have this bit of paper just for existing," he told BBC's Sunday AM.